Ok, let’s talk about your main goal. If we already know how to play, then we need to raise the skill level. On the other hand -imagine cozy home evenings accompanied by piano sounds: a small room, a grand piano, a pianist who can also be a listener. It is important for us to feel every note, even if the volume is set to the minimum level. Yamaha P-125 – a P-series Yamaha digital piano – which came to replace the legendary P-115, completely copes all these tasks. I will describe in detail the features of the new model and will share my impressions of playing on it, and of course I will talk about main specifications and compare it to other similar models. What is included in the package and what are optional accessories? What is the difference between Yamaha P-125 and P-115? Yamaha knows its customer perfectly, that’s why it has implemented such function as Intelligent Acoustic Control (IAC), which as you can see from the title is responsible for acoustic control. Thus, low and high frequencies sound balanced and the sound is not lost at low volume of the instrument, like it happens in some other digital piano models. The function is activated by pressing the appropriate button and is not forced. Yamaha P-125 has 24 voices onboard, which is more then the competitors have. Voices include various types of Pianos, E. Pianos, Organs, Harpsichord/Clavichord, Strings, Bass. So if you are tired of piano, you can play with other voices, the quality of timbres is decent and they don’t sound synthetic. P-125 has 20 rhythmic patterns. Choose your favorite style or experiment with something not yet mastered. The rhythms include some from Pop&Rock, Jazz, Latin, Kids&Holiday. Done with the rhythm? Add the bass to your rhythm and play along with an accompanying rhythm section. Also 50 preset songs are pre-recorded in the instrument. These are classical pieces by J.S.Bach, W.A. Mozart, F.F. Chopin and other great composers. And there is a function to record and playback your own performance. And if you want to transfer your performance to computer it is very easy to do with the USB-to-Host connector which is available on the back side of P-125. The weighted keyboard called Graded Hammer Standard simulates a hammer keyboard of a real acoustic piano. 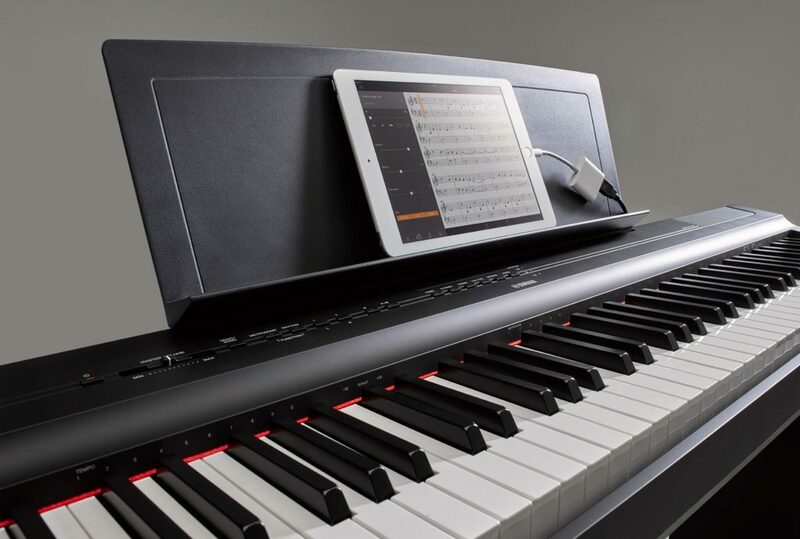 If you managed to play a technically complicated sketch on an acoustic grand piano, then there will be no problems with its performance on this digital piano. 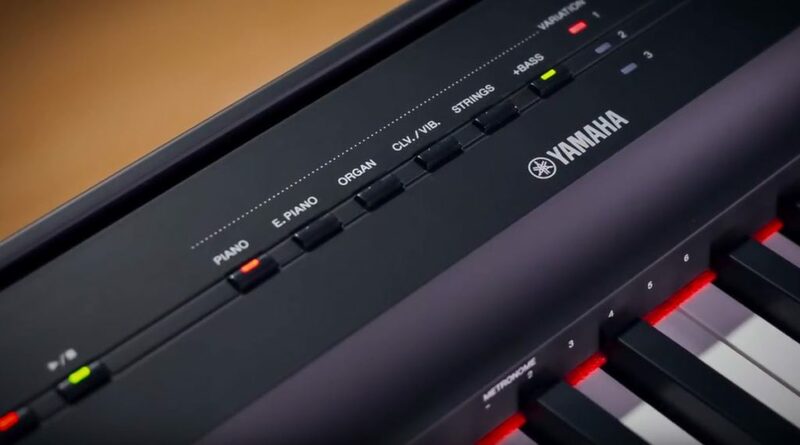 The Yamaha P-125 keypad sensors work well for their task and allow you to perform fast temperament, responsive to pressing a key in any of its ranges. Perhaps, a sputtering on white keys is one thing that you could ask for (it is only on black keys), so that fingers do not slip during long playing sessions. Yes, and in general the texture of the keys – it would be a plus to authenticity, for which all manufacturers are struggling digital piano. But this is available only on higher class models, such as P-255. Speakers – one of the most important elements of any digital piano. In Yamaha P-125 the speakers are arranged in such a way that the sound does not dissipate somewhere above the piano and does not play in opposite directions. The sound is directed to the performer – it allows you to enjoy your own performance even without headphones. And it’s logical, any piano for beginner or professional should be built “under the performer”. The speakers in P-125 produce an expansive piano sound in both upward and downward direction. So Yamaha implemented another nice feature called “Table EQ”. What it does is automatically detects whether you’ve put a piano on a hard flat surface (such as a table) and corrects the sound settings so that the sound goes more to the top with enhanced EQ characteristics, and you will notice more powerful and natural sound going not to the table, but straight to you. But, no matter how steep the speakers, the samples of sound and the sound processor stay on the first place. It is clear that the perception of sound is subjective. If I write that it is bright and saturated – it is unlikely that you will be convinced. In addition, in different price categories it is “bright and rich” in its own way. Therefore, I can present you an exceptionally objective confirmation – P-125 specifications: a polyphony instrument 192 voices. The average value for competitor brands is 128 notes. If you are still thinking about doing the shows and 14 watts of built-in speakers is not enough, and you hear discontent from the audience sitting behind you, they say something about the melodic line in the third octave which does not sound bright enough … It does not matter – you just take the amplifier, the external speaker system and connect to the AUX output. Thanks to the Japanese that they took care of this. The lack of a MIDI output is compensated by USB TO HOST – the standard solution for many modern electronic pianos. If you are practicing with a teacher, then you would make use of the 2 phone jacks. Of course I should mention about additional features which almost all pianos in this price range have. I’m talking about Duo Mode – a mode for interaction “the pupil – the teacher”, Split Mode – a mode to split the keyboard into two parts and put each hand on different instrument, and Dual/Layers Mode – it allows you to combine two different instruments and play them at the same time. Yamaha has a set of special apps for iPhone and iPad. One of them called Smart Pianist allows you to remotely control many settings of your P-125 and save them for quick access. You can also practice and perform songs with Smart Pianist while it analyzes songs stored on your iOS device and displays the chords for you. Another nice feature is Auto Power Off – actually it does what is says – it turns off the instrument if you are not playing on it for 30 minutes. But it could be easily turned off. You can additionally order optional furniture-style keyboard stand called L125. It is designed specially for P-125, looks great and perfectly fits the instrument, it is very sturdy. If you need compact X-style stand – there would be also no problem to choose one and to put this keyboard on it. Of course it will not look so stylish, but it’s ok if you are going on gigs and often take your piano with you. 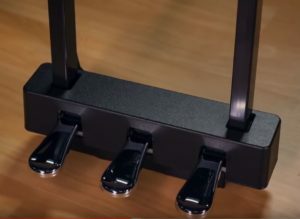 Another must buy accessory for professional musician is a 3-pedal unit. Like the piano itself, the LP1 pedal unit is available in two colors – black and white, and looks great with the L125 stand. However if you are short on money, there is no need to buy triple pedal unit at once. The single sustain pedal comes in the package, so you will be ok with it. And if you are buying piano for your child, who is just starting to learn playing, then you will not need any pedal at all for the first couple of years. This piano is a new model, which just appeared in 2018, so you can’t expect the price to be too low. But even now you may find P-125 on Amazon for just a little more then the previous P-115 model. 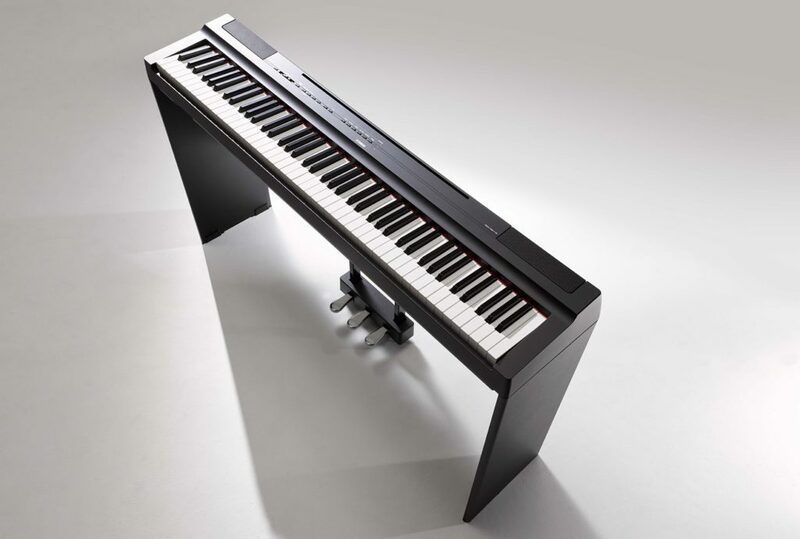 Of course if you count the stand and optional triple pedal unit, then it would be quite costy, but if you just need a good modern instrument – the new P-125 is great choice with the ability to upgrade with optional accessories later. P-115 is a very successful and has been top-selling Yamaha digital piano model for many years. But after some time every model needs some renewal, you may call it “facelift”. 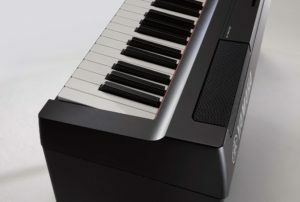 Not to break the success of its predecessor Yamaha created very similar digital piano in the same segment. Actually P-115 and P-125 are very close by characteristics. They are of the same size and weight, polyphony, sound engine, keyboard action, same external connectors. Some of the differences are that P-125 has more built-in voices and rhythms (but has no Pianist styles), a newly improved 2-way speaker system (with optimal sound on the table), Smart Pianist app support for iOS. There are also slight differences in design, P125 looks more modern as any new thing. There could be more innovations, but this is what we got. So if you liked P-115, then you are certainly ready for P-125, as they are almost the same. If I would be looking for something to complain about in P-125, then I would say that it could come with the keyboard cover, though it would be not so portable and probably would go to the segment of home digital pianos. Indeed, the dust can not hide anywhere and if you want to keep the instrument in a constant “always ready” state and do not want to experience discomfort while you play, then it makes sense to purchase a velvet cape for the keys separately. It is quite inexpensive, but it will be very practical. Yamaha P-125 is the right start for any beginner and an excellent option for home workouts. Having 23 voices and 20 rhythms it will definitely please you with the sound, simple integration with iOS application and good GHS action weighted keyboard. If you were looking at P-115, then I would recommend buying the P-125 instead. To check Yamaha P-125 price on Amazon click here. 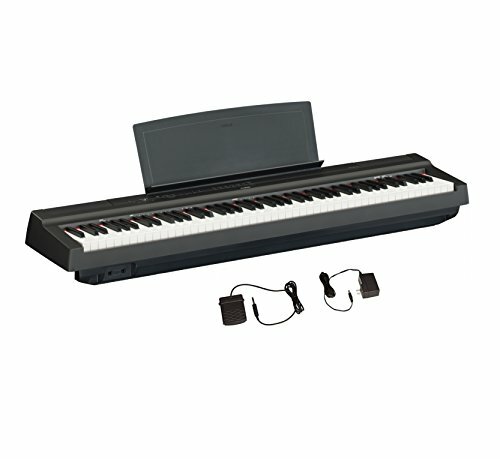 You may also like: Yamaha P-121 – 73-key portable digital piano with weighted keys. great review i will be adding mine soon. i had the p115 and upgraded it to p255 which is amazing. I AM MOST GRATEFUL FOR YOUR THOROUGH COVERAGE OF THE P125. I HAVE LITTLE KNOWLEDGE OF ELECTRONIC PIANOS, HAVING PLAYED TRADITIONAL PIANOS ONLY FOR MANY YEARS, AND AM ABOUT TO PURCHASE A P125. acAdapterShop.co.uk on What is the Difference between a Digital Piano and an Electronic Keyboard? What is the ideal age to start learning piano? What is the Difference between a Digital Piano and an Electronic Keyboard? Copyright © 2019 Digital piano guide. All Rights Reserved.